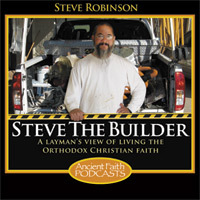 A layman's view of living the Orthodox Christian Faith. Steve begins a four part series on "Capital Punishment". In Part One he chronicles his work with emotionally disturbed children and the beginning of his shift from radical pacifism to a reconsideration of the death penalty. I spent most of my high school years and part of my early adult life as a radical pacifist. I registered as a concientious objector during the Vietnam War. I was anti war, anti self defense, anti death penalty, and when I became a member of a Bible Church, I gathered scriptures to justify all my convictions. Years later, when I finally got to a point that I could be brutally honest with myself, it was about the 60’s and being cool with my friends in the art department and a “Jeremiah” to the “establishment” in my Church …and it had more to do with Woodstock sentimentality adorned with scriptures than true personal conviction. My hazy philosophical views started shifting when I began living in the real world and not in the dazed and confused world of the hippie subculture and seeing the world from penthouse view of the ivory tower of theoretical theological speculation culture of my protestant seminary. I know for certain the concrete shift in my thinking happened when I took a job running a residential treatment center for severely emotionally disturbed boys who had tendencies toward uncontrollable rage or calculated sociopathic violence. Soon after I arrived, the teacher in our self contained classroom on campus called me from the office because one of the boys had gotten angry and picked up a baseball bat and was demolishing the classroom. I was all of 110 pounds and despised athletics, and it showed. I opened the door of the classroom and Terry looked at me and shook the bat at me. “You come near me you (blank blank) and I’ll bash your head in!” The rest of the kids stood outside the door and watched to see what I would do. Non-violence and pacifistic non-resistance might make good classroom discussion and arm chair philosophizing, but being faced with being beaten to death with a baseball bat by a 180 pound hyperactive kid with rage issues and an IQ of 65 is not an abstract discussion question on an essay test, it is real. I was too new at the job to make the wise decision to just call the police (who I later found out in other situations don’t believe in passive non-resistance), so I went in the room and started trying to talk him down. I got close to him and he raised the bat over his head to hit me. He was big and slow and I managed to get under the bat and tackle him and I took him down. Fortunately for me he didn’t try to wrestle with me. He got up and ran away like he always did after a physical confrontation… and he always returned by suppertime because he got hungry and was afraid of the dark. The public confrontation laid a foundation for my reputation as the director of the home. But it also laid a foundation for my shifting view of the world. The incident was told and retold by the kids over the next few days. It eventually became mythical over the next five years. Because I’m half Chinese, the apocryphal story that was always told to the new kids who entered the program eventually took on Bruce Lee fighting Chuck Norris proportions. The fear of being wheel house kicked into the year of the Ox kept most of the new kids from some violent behaviors, at least while I was on campus. Once a new kid decided to take me on and took a swing at my wife with a pool cue. Fortunately there were several staff people in the house at the time and we managed to restrain him. The next week, I signed up for street fighting classes at a karate studio. I had finally and pragmatically faced the fact that fear of retributive violence was a deterrent at least for some people. Someone once told me, “Principles are what you have until you have real needs”. The world of the treatment center was a microcosm of the fallen universe. I lived with kids who were damaged, some perhaps incurably. I watched a kid beat another one so mercilessly his calculating coldness and brutality was frightening. (I truly believe he is probably a sociopathic serial killer by now.) The rules and culture of the treatment program was also a microcosm of how society deals with fallen human beings. I realized that radical pacifism in the end is the open door to anarchy and proliferation of evil. In a societal structure if there is no fear of retribution, innocent people WILL become victims. Fear of punishment protects the innocent from the evildoer. So, I could have, out of pacifistic conviction, let Terry beat me to death, but when faced with a snap decision the visceral response was, out of love for 12 other kids and a teacher, I could not stand by and let him beat them to death. It was my Woodstockian seminary classroom philosophy versus my gut. Which was right? For the next few decades I wrestled with my position of being anti-death penalty. Across the years I’ve mentally collected stories of all manner of human evil, heinous and horrific and perverted destruction of human lives. Beneath the weight of the evil of the world, and through what I believe is the clear Biblical witness that human beings are indeed capable of unimaginable evil, I’ve changed my view on capital punishment. I find it personally ironic that Bp Seraphim says “talk is cheap” and Christians should visit prisons instead of supporting the death penalty. It was because of and exactly the realities of my involvement with such ministries that my philosophical views of capital punishment have changed. Since my days at the Boy’s Home I’ve hired and worked with ex-everythings, and have a former drug addicted employee who is currently on death row for the brutal murder of his mother and girlfriend. These reflections are not written from a safe distance from human evil. They are because I’ve been in the trenches with it in various ministries for the last 40 years. I wholeheartedly agree with him that we should bring the hope of the gospel to those in prison, but I do not believe that automatically translates to being against the death penalty. So, I’ll say up front that this discussion is not an attack on Bp. Seraphim, but his statement can be viewed as the creed of the anti-death penalty position. His statement succinctly summarizes the arguments against capital punishment, not just within the Orthodox Church, but within the broader Christian tradition. His statement and the one issued by the OCA’s All American Council might lead one to believe the Orthodox Church uniformly and universally stands opposed to capital punishment, or at least leans heavily in that direction and those who support it lie on the fringes of the Tradition. But it is interesting that the Coptic Orthodox Church of the Diocese of the South on its website supports capital punishment. St. Theodore the Studite in the 8th century argued against capital punishment for heresy but supported it administered by the state for capital crimes. I am not a Church historian but I think I’m safe to say that at the height of “Byzantium” (and I would also conjecture in “Holy Russia” in its heyday, and in every other “Orthodox country”) where the Church has had the most influence on the State in matters civil, the States have practiced capital punishment for capital crimes. I am not in a position to judge who is more holy in regard to capital punishment, the OCA or the Coptics, America or Byzantium, Bp. Seraphim or St. Theodore, but it is clear historically that the issue has more wiggle room within the Church than Bp Seraphim implies.